This meal is one of my favorites. The description doesn’t do it justice. It has more beans than this soup despite them being mentioned only in the ingredients and makes better use of squash than this meal. It’s spicy, though not “3 pepper” spicy as the package says, slightly sweet and sticky and very aromatic. It tastes like it actually could be someone’s family recipe instead of the product of a food lab. The beef is a bit chewy, but it feels more real because of it. I love finding visible herbs and spices and this one usually has a bay leaf or two. Even the rice seems like some love went into it. 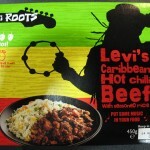 Bravo, Levi Roots, bravo! Note: Something is wrong with the nutrition info on the package as the calories per nutrient don’t add up to the listed total. Definitely agree with you there – this is a newly discovered favourite of mine. 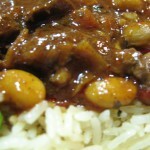 I find the beef half-tender/half-chewy, the flavours and textures are great (even when microwaved).